I had a remarkable experience last week that I’d like to share with you. For the 3 decades that I have been a coach/trainer in the field of leadership. I have also practised various forms of Tai Chi and Qi Gung but have, as yet, never combined the two; up until now! Last week I had the pleasure to co host a group of senior account holders, for a major facilities management organisation. To my (pleasant) surprise I found out that the session would begin with a Tai Chi session run by a most excellent teacher, Chris Shaw, who has many years experience of delivering Tai Chi in Leadership courses. The Berrison course designers told me that they deliberately wanted to throw a curve ball at the delegates. They wanted to put the delegates outside their comfort zone. They wanted to introduce this as a concept for the day; how leaders cope in difficult and uncomfortable situations and how it affects their performance. I had worked with this group for nearly a year. Together we had visited the concept of moving beyond ones comfort zone in order to ‘feel the fear, and do it anyway’. Because of this, I was more than a little intrigued to see how it went. Suffice it to say, I was more than pleasantly surprised how open they were to it. I expected them to be a little retisent. Apart from it being a specific exercise in order to introduce a concept, it was also an excellent way to start the day with loads of (caffeine free!) energy. 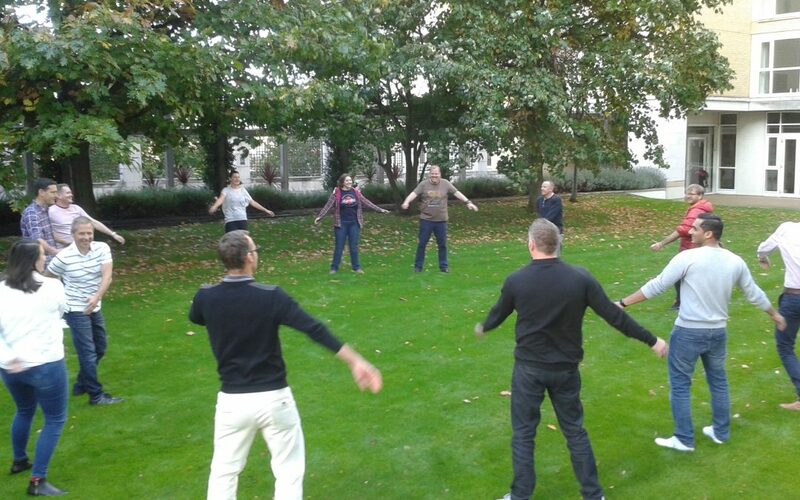 We gathered on the lawn, bathed in autumn sunshine and began the day with a few exercises. Some of the group took to it quite naturally, but you could see that one or two were finding it quite difficult. It was the looks on their faces, not any physical difficulty that told what I needed to know. They were wondering why they were doing it. However, with Chris’s guidance (and patience) they were soon moving like they had been practising for years! “The group members need the leader for guidance and facilitation. The leader needs people to work with, people to serve. If both do not recognise the mutual need to love and respect one another, each misses the point.”After lunch we also took time to have a guided Mindfulness session. It proved to be a great way to begin the afternoon sessions. Each person said they felt refreshed and energised. In the future I will certainly find ways to incorporate some of these concepts into my Leadership sessions. After all you can never feel too refreshed or energised!